Mood disorders, sleep problems, anxiety, headaches, and/or weight problems can all result when you suffer from a deficiency of Serotonin (SDD). 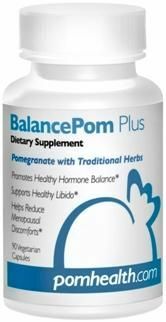 Clinical studies demonstrate that many individuals with SDD benefit from supplemental 5-Hydroxy L-Tryptophan (5-HTP), usually one to three capsules per day. 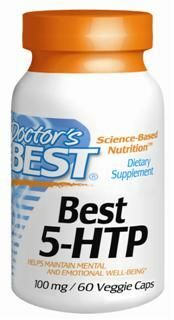 Always best taken with meals, BIOS 5-HTP is the finest available and fully tested for impurities.Better Mood, Better Sleep, Quality Counts - and What About L-tryptophan? 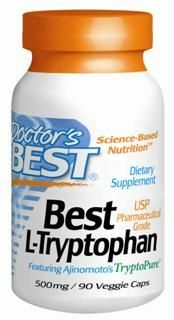 5-HTP and L-tryptophan are closely related biochemically, yet for some people L-tryptophan works better. Others may receive more benefits from 5-HTP. 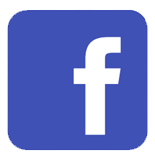 Learn why that is so, and how to tell which is best for you. BIOS 5-HTP is the finest Swiss pharmaceutical-grade available! Some might mistakenly suppose that because 5-HTP is closer to serotonin, it might be more effective. Actually, the key to the benefits are more closely related to where the conversion to serotonin takes place. Since serotonin will not cross "blood-brain barrier," a protective barrier that tightly controls what can pass from the blood to the brain, the only way to get serotonin to the brain is as 5-HTP or L-tryptophan. Clinically, I see a wide variety of responses to 5-HTP. Some people achieve great benefits, while others receive little or none. While we do not yet have a complete answer, some recent research, at least, sheds some light on reasons for the different responses. Recent research using PET scan technology has found that patients who have ever had major depression have impaired transport of 5-HTP across the blood-brain barrier. These patients may do better using L-tryptophan. It may be that the patients who do better with 5-HTP may have a similar impairment of transport for L-tryptophan. 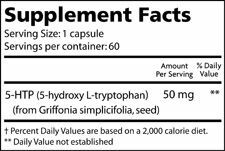 In either case, a clinical trial of 5-HTP vs. L-tryptophan may be the easiest way to determine what is best for you. 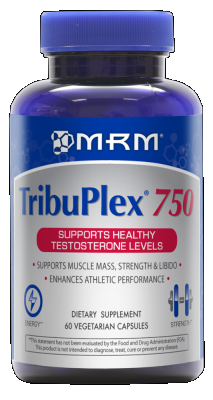 Suggested Use: Adults: Take one (1) capsule two or three times per day with a beverage or meal, or as directed by your Doctor. Other Ingredients: Vegetarian capsule (kosher) arrowroot flour (hypoallergenic). How does 5-HTP help with improving mood? 5-HTP, taken as a dietary supplement increases serotonin levels which, in turn, helps ensure proper function of the satiety center. The end result is improved mood and fewer cravings. In addition to increasing serotonin levels, 5-HTP is also a precursor molecule to melotonin, a substance with definite sleep-enhancing properties. This can help you to feel less fatigued, and since there are few things that improve mood better than a good night's sleep, it can also help you have a brighter mood. 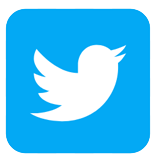 Distributed or manufactured from Lidtke. See more Lidtke products. 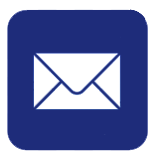 Thank you for contacting us about 5 HTP. 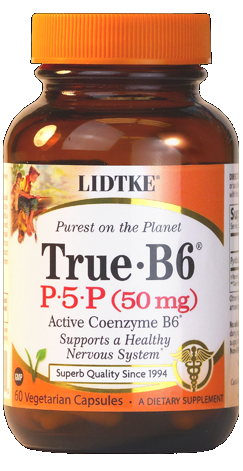 I beleive Dr. Oz has discussed 5 HTP however I am not aware of the specific brand he may have been referring to. 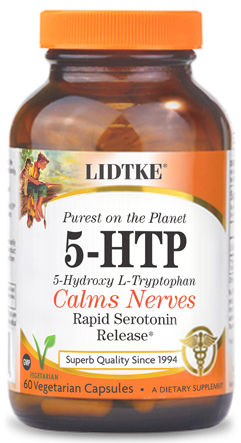 Benefits of 5-HTP and L-tryptophan is a neurotransmitter called "serotonin." An adequate supply of serotonin is often the key to: Promoting Weight Loss, Supporting Emotional Balance, Achieving Deep and Restful Sleep, Calming Nervous Irritability, and Supporting a Cheerful Mood.